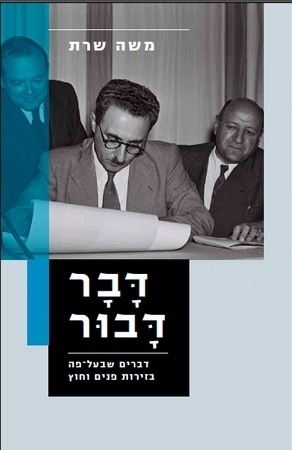 Speaking Out is a series of nine books – a volume a year - dedicated to the speeches made by Moshe Sharett, Israel’s first foreign minister and its second prime minister, during his service in the Israeli cabinet. Speaking Out, 1948, is the first volume of the series, published in 2013. The 86 documents of this volume, the majority of which were culled out of the protocols of the Israeli provisional government, vividly portray the challenges met by the young state born amidst blood and fire and forced to fight simultaneously on two major fronts – a military one on the battlefield, a political one in the international arena. How was UN mediator Count Bernadotte’s plan to tear away the Negev from the State of Israel rebuffed? How did Israel withstand international efforts to let the Arab refugees return to their abandoned homes while the war, initiated by Israel’s neighboring Arab countries, was still raging? What were the international implications of the arrival of the IZL arms ship Altalena at the shores of Israel during the agreed cease-fire? These, as well as other pressing problems, had to be adroitly dealt with by the foreign minister. Israel’s War of Independence has been depicted in many books, but works about its political struggles, overseen by foreign minister Moshe Sharett, are almost totally missing. Speaking Out, 1948 is a valuable contribution to this neglected front.